This is a fascinating passage from the Bible. Nowhere in the Old Testament is there a prophecy that a star would appear when the promised Messiah was born, and yet when the Magi arrived at King Herod’s doorstep, they announced that they had followed the Messiah’s star, which apparently had just recently appeared. These men were star gazers from the Persian/ Chaldean area. They knew that that particular star signaled the birth of the baby Messiah, the birth of the great plan of redemption. They understood and were aware from the Scriptures that He would have been born in Bethlehem, and yet they went to Jerusalem, fully anticipating that the baby King of Kings would be there at the palace. How sad that the Magi, clearly Gentile travelers from the far East, understood and anticipated the coming Messiah more fully than the Israelites to whom He came. So to what exactly were the Magi referring when they told King Herod that the Messiah’s star had appeared? Do you see that tiny star in the baby’s eye? The name of this star is the same as the sign itself: Comah. I would like to quote now from a book entitled The Witness of the Stars by E.W. Bullinger, D.D.. This book has been a very helpful source for information for this website and the Free e-book. He gives some interesting and enlightening information. Bullinger goes on to say that one more factor would place this new star in the sign of Coma. Consider the meaning of the names of the stars in this constellation. Remember that the Magi were very learned men. In fact, the English New Testament translation of the Greek uses the words wise men. They studied the ancient star chart. They knew the names of each star and constellation. They knew that Coma meant “the desire of all nations” and they were aware of Haggai’s prophecy. 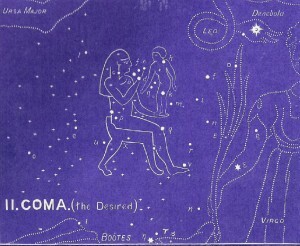 The Magi recognized that Coma represented the baby Messiah, so when a new star (or a super nova) suddenly appeared in this constellation, they packed their bags. They must have been waiting longingly for this star to appear. They knew they would have the privilege of doing what so few people on earth would ever do — worship their Savior in His condescension to mankind. Here is the picture of a young woman holding a small child. The star that forms the baby’s eye is named Comah, “The Desired One.” Today, it is very faint, but at one time it was a bright super-nova. Mythology says that this is Berenice, who offered to give her hair as a sacrifice if only the gods would bring her husband safely back to her from battle. When he returned unharmed, she loyally offered her hair. 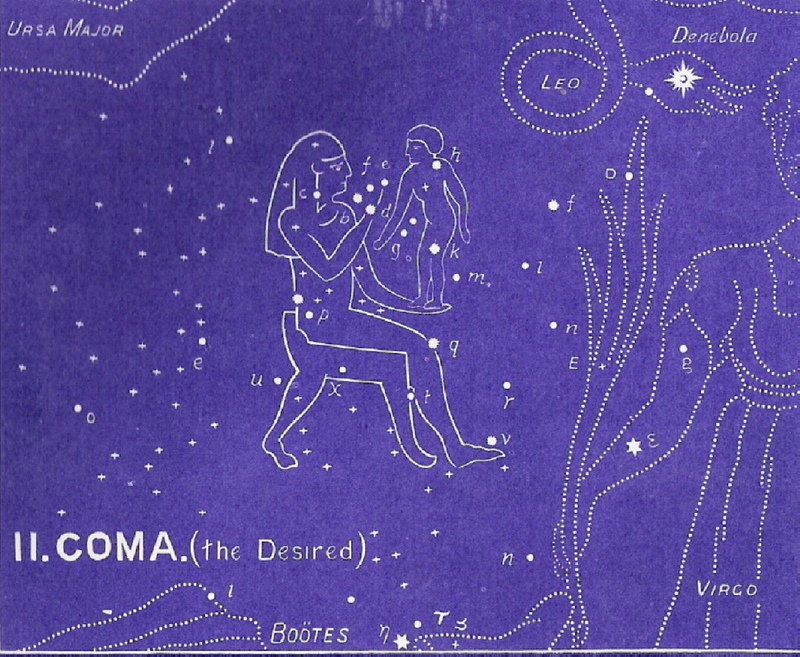 As a reward, her hair (“coma”) is placed among the stars. The more ancient planispheres all show a young woman holding a baby. The tale of the woman’s hair had no resemblance to the original truth. However, the original picture was of a woman holding a baby whose name was COMAH, the Desired One. This is the picture of the Lord Jesus Christ, born of a virgin and desired of all nations. The Bible presents Jesus Christ as coming from the Father in fulfillment of all Old Testament prophecies. As such, he was the One for whom the Jews were ever looking. He came as the King, ready to extablish His kingdom. He was rejected, and sadly, He went unrecognized as the One to be desired, the all-essential One, the One to be sought after and served with humble, loving service. To continue in the correct order of the ancient star chart, please select Centaurus next. Or go to The Big Picture for more information about the Gospel in the stars.